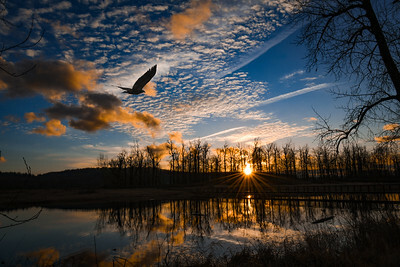 Combining long lens bird photos with landscape shots taken from the same location creates a more true to how our eyes see nature experience. This Northern Harrier matched this low light landscape grayness perfectly. It looks like it was made for a day like this. 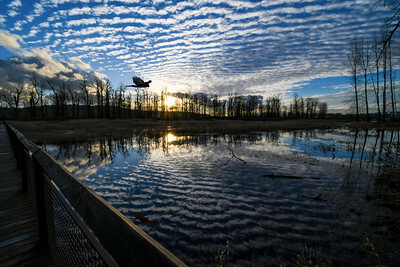 Portland's Force Lake offers photographers the opportunity to park next to it on rainy days and shoot waterfowl in flight as they shuffle between local nature parks. The multitude of duck species present, often including Redheads, seem to be very acclimated to human presence. 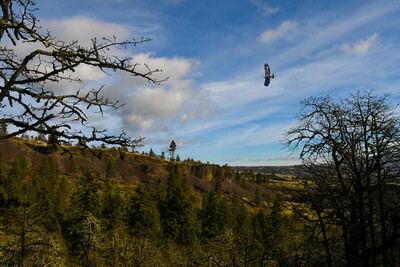 This is a sweet spot to shoot thousands of photos in practicing flight shot techniques. Redtail Lake is next to the Columbia River just to the north of the levee. It is known to have a wide variety of ducks, geese, Virginia Rails, and American Bitterns. 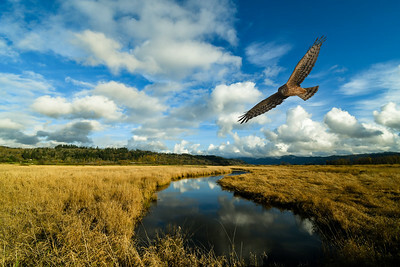 Photographers can position theirselves on its bridge to shoot Bald Eagles, Harriers, Peregrine Falcons, Kestrels, Merlins and occasional Short-eared Owls that frequent the area. This juvenile flew low across the lake just minutes before the sunset. I had high hopes for the higher cloud formations, but they fizzled and all the color was projected onto the lower ones. Catching the ray strands made up for the under-performance of the clouds. The two layers were photographed within 3 minutes of each other from the same vantage point.